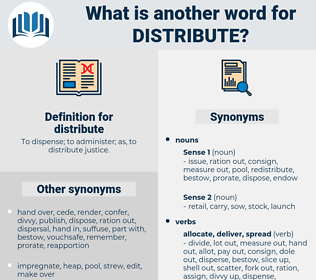 What is another word for distribute? To dispense; to administer; as, to distribute justice. distribution, disseminate, Disseminated, available, dissemination. disseminate, deliver, transmit, provide, diffusion. 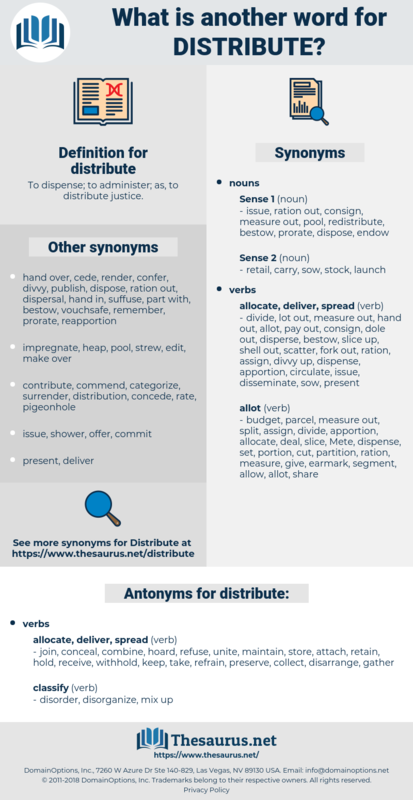 disburse, resell, reallocate, disperse, disseminate, publicise, popularize, split, redeploy, deliver, convey, decentralize, allot, promulgate, disclose, prorate, transmit, divulge, arrange, sell, diversify, provide, representation, dissemination. join, conceal, combine, hoard, refuse, unite, maintain, store, attach, retain, hold, receive, withhold, keep, take, refrain, preserve, collect, disarrange, gather. confiscate, appropriate, lump, begrudge, confuse, niggle, stint, seize, reject, decline, mix, deny, deprive, arrogate, scramble, skimp, jumble, resume, mistype, disallow, pinch. The former was organized to distribute relief to the poor in the stricken city; the latter was formed to keep all patriots in all of the thirteen colonies in touch with each other, and to observe the approach of the great current which was surely bearing war upon the waves that formed its crest. She has brighter eyes than she knows what to do with and more smiles than she has a chance to distribute. scatter, be, spread, spread out, exist.